National's welfare policies - time to bring out the accusations of "misogyny"
I was just listening to political commentator Linda Clark on TV3 saying she thinks there is a gender split in the response to National's welfare policy. That even well-paid, well-educated women like her (and she included the interviewer) have trouble juggling children and work and affording quality childcare so (by inference) they empathise with the plight of poorer women. The males she has heard commenting On the policy seem on the other hand to think people will like it. This is the slant the left are putting on the proposals. That they are misogynistic. Shallow. Do they really believe that the way the DPB has undermined family and harmed children means more of it is needed? That when all is said and done the DPB has been good for women? Apart from which, the women I speak to feel somewhat aggrieved that they work, get maligned for putting their kids in childcare and pay the taxes that fund others who get praised for staying home. One, reacting to the idea that a child added to a benefit should get one year of state assistance in line with parental leave said to me, nobody with a job gets a year of paid parental leave. Also I hear plenty of female callers to talkback supporting a toughening up on welfare. Many thanks to all of you who sent birthday wishes yesterday via Facebook and e-mail. Much appreciated. Sorry I haven't sent personal thanks. Have been frantically busy. National's release of its welfare policy meant I had a number of calls for a response. I did a couple of radio interviews but turned down TVNZ. I just couldn't face the sleepless night that typically precedes an early morning slot. A full column about the reforms has just been completed and I will post it soon. Have quite a bit of artwork queued up and kids have assignments and end-of-year exams which they need help with. So I better get on! Don't know if Tumeke is still collecting these but as I have nothing else to say today....yet..... 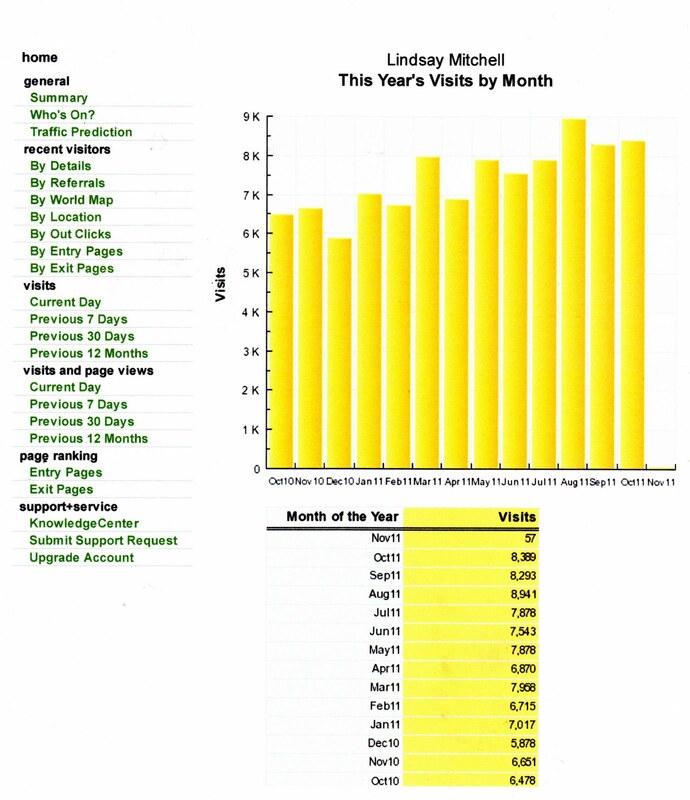 I thought I'd post my stats. 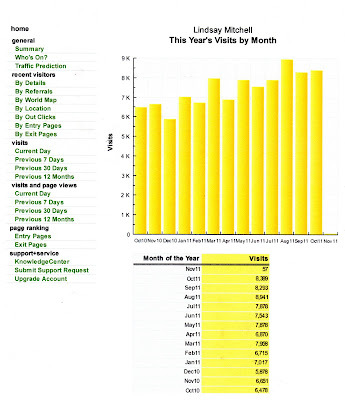 Next month will be the blog's 6th birthday. Golly how time flies. I don't like all the name changes. What will the IT implementation and printing costs be? The problems of dependency aren't going to be changed by re-naming benefits. I have always opposed name changes, as did National when Labour looked like doing it. Ironically now Labour opposes what National looks like doing. The part-time work-testing on the DPB drops from youngest child aged 6 to 5. However if another child is added the work-testing rules are suspended for one year. Because a lot of people transit on and off the DPB it'll be interesting to see if the same rule applies to a new benefit spell. Unhappily there is still room for someone to keep adding a children to avoid work-testing. Between one third and a half of current DPB recipients started on welfare as teenagers. If a teenager can still get 5 years on the DPB without work-testing (and at 16 or 17, five years into the future is a very long time away) is that going to be a big enough discouragement to stop this continuing to happen? Many countries - US, some Canadian provinces and Sweden is thereabouts - expect parents to be in work from when the youngest is one. Norway at three. The WWG recommended dropping the age to three. Which is when free early childhood education kicks in. The sickness benefit is already work-tested so no change there. Reduction goals. They are talking about 66,000 in the next 4 years. In the 4 years running up to 2008, a strong economic growth period, the Unemployment Benefit alone dropped by 52,000. So if the economy improves the goal doesn't look particularly ambitious. NewstalkZB has me saying that National's leaked goal of moving 46,000 off a benefit is "unambitious". I suggested they could double that target. Not sure if they are using other soundbites from the comments I made on request (with very limited information) but here is my reasoning. People will naturally leave the unemployment benefit as the economy improves. They already are. That's what happened between 2004 and 2007 when the total on the dole dropped by 45,000. So National could meet their three year target without any focus or improvement on the other benefits. I also said that at $9000 a job, that's very expensive from the taxpayer's point of view. Especially if an improving economy can achieve the same reduction without the extra expenditure. And it's all very well to talk about moving people off welfare but the arguably more important goal is to stop them moving on. For example of all the babies born in 2010 23 percent were relying on welfare by the end of the year. People going on the DPB with a newborn will frequently stay there for many years - unlike those who typically have a much shorter stay on the unemployment benefit. Maori Party rejects 'free lunches'? Rarely do I fall on the same side of an argument as Tariana Turia. But on the subject of expecting the state to feed breakfast and lunch to children I give her a tick. Of course this stance has been prompted by Hone Harawira's call for the opposite. “Gone are the days when we allow the State to take over the role of families; to encourage whanau to abdicate their responsibilities” said Mrs Turia. You only need to look at my previous post to see the absurdity of that statement. “The last thing we need is for another politician to come in to save our families by handing out free breakfast and free lunch to their kids”. “It’s patronizing, it’s demeaning and it devalues the vital capacity of our whanau to take responsibility for their own children’. Now all you need to do is develop that line of thinking. Doesn't handing out benefit cash do the same? “Hone has picked a number out of the air ($38m) but the costings are at least ten times that” said Mrs Turia “and that’s not for all children either”. “If we provided free breakfast and lunch to the children the Child Poverty Action Group has classified as living in poverty (230,000) that brings a cost of $368m per year – that’s right - a billion dollars for the next term of Parliament to authorise politicians to take over the rights and responsibilities of families”. Well said. Good to see an influential politician doing the sums. Next do them on what extending the In Work Tax Credit to beneficiary parents would cost, your policy. Even more. “We must resist any attempts by politicians to paint our families as incapable of doing for themselves. We should be working to inspire hope; to remind our whanau of their capability to feed their children, provide a healthy lifestyle, a warm and secure home”. “Government’s job is to ensure that there is support for families to look after their own; that there is meaningful work available; and a minimum wage of at least $16 an hour”. "Support for families" must be code for the DPB which Tariana has always backed. So it is OK for the government to "encourage whanau to abdicate their responsibilities" after all? Because that's exactly what the DPB does. The government's job is to ensure they do not get in the way of the economy producing jobs, for example, by enforcing minimum wages. “And we must restore to ourselves our time-honoured traditions. The Maori Party has invested in the recreation of maara kai so that our whanau can fend for themselves, determine their own futures”. “Our whanau are our future – not a politician handing out a free lunch”. In the final analysis she doesn't want a literal free lunch but a figurative one is just fine. What if all women relied on welfare like Maori? 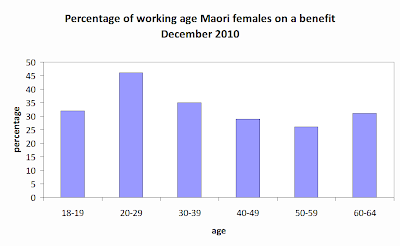 In 2006 40 percent of Maori women aged 20-29 were beneficiaries. This is quite revealing. Nearing half are dependent when young, but many do not overcome that dependency. While quite a few Maori women will go into work after raising a family, many others won't and will appear in either the DPB, DPB Women Alone, Unemployment, Sickness or Invalid Benefit statistics. Maori women disproportionately experience ill-health, unemployment or take on care-giving for sick dependants, grand children or other whanau. 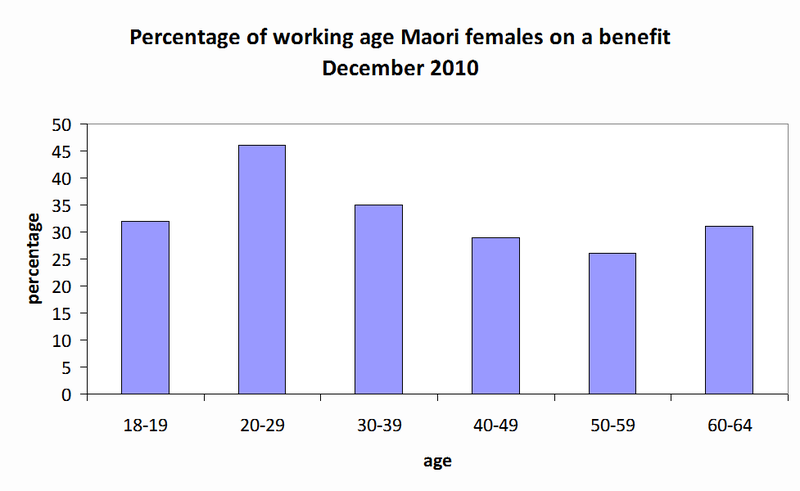 Anyway, if the rate of dependence for working-age Maori women extended across women in general, there would be almost half a million working-age New Zealand females on a benefit. As it stands there are around 190,000.